GRT's own Ned Cato Jr re-elected to Comic-Con Board for 15th year! Wow.....15th year re-elected to the Board of Directors of Comic-con International:San Diego. As of August 12th 2012, the day of the Elections. I begin my 15th term as a Board Member. I am Proud that I represent the Committee members that voted for me. I am proud to represent Exhibits department in which I work. I am also proud of all the departments the comprise One of the largest fan-run in the country. There are upcoming challenges that Comic-Con will face....A too small convention center, other shows encrouching our Southern California presense, rising costs. We have a lot to deal with but I believe that this show is a unique show and will survive the upcoming challenges. I will try to bring you interesting info during the next year from my unique postion on the Board. Stay Tuned. It has been a HARD 11 months for me, but it has all lead me to one conclusion, The Show Must Go On! My Mom and Dad are both geeks and gave me my love of The World of Geek. From my Dad, I got my love of Comics and Classic movies, and Toys, and from my Mom I got my love of Japanese Giant monster movies and action figures. In July of 2009 my Mom, Brother, Sister, and their kids came out for a visit from New York. We talked about Comic-Con and my being a board member and other things. She brought me a replica of Mecha-Godzilla, that she carried on the plane. Then, roughly 3 and a half months later I get a phone call from family telling me my Mother is gravely ill. I rush home and spend time with her in the Hospital. After 10 days I run out of cash and have to come home with plans to return. November 12, 2009, I get a call from my brother in tears telling me my Mother has passed away. I am numb for the next 6 months. I consider quitting Comic-Con and the board and giving up this site. But, my Geek friends won't let me. The love and support I got from my friends, still surprises me to this day. Thanks to all of you. I also want to say thanks to all the folks who came up to me after The GRT panel this year and shared their sympathy and their own stories of loss. Thank you. All that support said to me, that the show must go on. I dedicate The GRT website to my Mother. We are going shorten the shows from over an hour, to 45 minutes to up to an hour. What this means is because most of the cast is all over California, we will Skype more shows to make it convenient for everyone. We will not cut out full, live cast show, there will just be fewer live ones. This show will be a passionate exploration of The World of Geek, from Women in Geekdom to Racism in the Geekdom. This will be the Meet the Press for geeks. This show will concentrate on classic movies and will be manned by the old guys in the group, but not limited to them. We will talk classic films and little known gems. A fourth show, Rant! ,is more of a commentary bit that will mostly end up on You Tube, since they show will run anywhere from 10 minutes and up. This will be the show where geeks get to grind that Geek Axe. A new feature that we will also use will be The Empty Chair, where we invite a fan of GRT to sit in on a show(in person or via Skype). will will start the Empty chair in January. We are looking forward to the new format and will be changing the face of GRT site, to fit the new shows. If anyone wants to design new headers,will will put them up and give you full credit and put you at the top of the list for The Empty Chair. 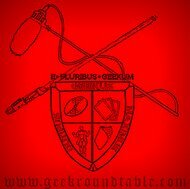 If you have any questions drop us an email at geekroundtable@yahoo.com. 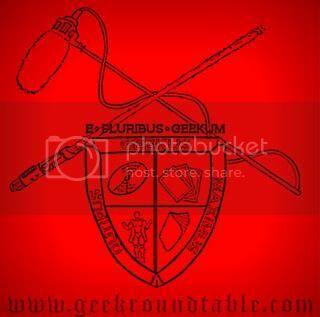 Though we at GeekRoundTable love to talk about spandex wearing,superpowered beings, we wanted to say thank you to the real heroes... The people who have defended justice worldwide, the Veterans of our Armed Services. 3200 web hits? Wow. I wanted to take a moment to reflect on the last five months and say thank you to the fans... You guys have laughed along with us these few months and watched this little show turn into a bad habit, just kidding! For me it has been a learning experience in patience and perseverance, going from someone who barely touched a computer and bitched about the state of all things geek to his friends, to a person who feels comfortable around a computer. We even presented a panel at Comic-Con,Wow. This has re-energized my commitment to all things geek, if we can't be there, we will try to report on it. I will try to rant on a weekly basis, and hopefully shows will go up faster and the quality which has risen in the last few months will continue. I again want to thank everyone who has given their time and effort to this project, and also thank the fans for sticking with us With the show on iTunes, it should be easier to find us. I am also issuing this promise, I will post at least 3 times a week,minimum! But, I also expect feedback from you guys, tell us what you think, tell us if you agree or disagree, love us or hate us, or just think our moms dress us funny. We have so much on our plates, over thew next few months from special guests to the much anticipated return of Wes, hopefully you will find something you love. Thanks again. I know it has been a while since I have blogged, but now that I have the feeling back in my body again, I want to give a big Geeky thank you to all the folks who attended the panel at Comic-Con, and to everyone who has been listening to the show and revisiting the site waiting for new content. Some cool things have happened recently. We are now on MySpace(thanks Ramona! )So don't forget to add us! We are also selling T-shirts and by the end of the year, we should be selling Hoodies!! The next few months are going to be fun. Some upcoming shows are going to be coming from a variety of places, such as the Anime show, the Ladies are going to have their day, there will also be a book show, and prepare for the Geeks of Color show... It will be a blast!!! Now mind you, we will still do the regular show with the regular cast of crazies(with a new face popping up every so often...) There will also be a few surprises coming too! Special thanks to Eddie Ibrahim for allowing the panel to happen, and a geek shout out to Mel Caylo from Top Cow and Brad Weiner from AMC. And much love to Marilyn and Michael at On Comic Ground. Keep listening True Believers, and remember we always keep a open chair for anyone who wants to sit in.